The Greater Washington County Food Bank Board of Directors and staff would like to thank you for all your time and dedication that you provided to make the "Push 4 Food Campaign" such a success; with the generous support of people like you, we are able to help so many families and individuals. Your infectious energy and enthusiasm that you brought to this project were immeasureable and the dedication and concern that you have for your YET children is very apparent. You might never know how much of an influence you provide them, but know that you have touched their lives beyond measure. 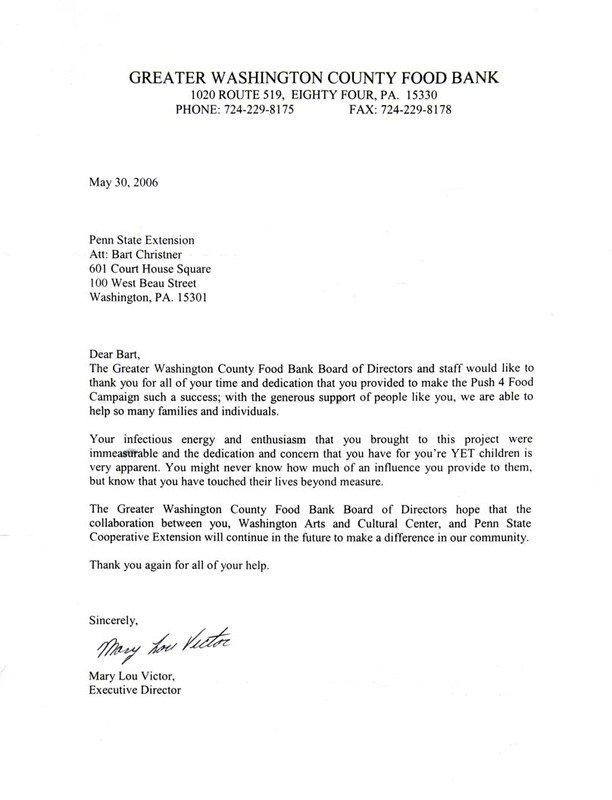 The Greater Washinton Food Bank Board of Directors hope that the collaboration between you, Washington Arts and Cultural Center, and Penn State Cooperative Extension will continue in the future to make a difference in our community.